PinPoint features fresh seafood and ever changing creative entrees to please the eye, as well as the palate. Chef Dean Neff oversees each dish as it exits the kitchen on the way to another phenomenal dining experience. Open Saturday and Sunday for Brunch from 10:30 pm to 2:00 pm. The brunch menu changes often, reflecting the availability of local produce and proteins. Saturday’s menu will feature a daily special created by Chef Dean Neff using items purchased from the Riverfront Farmers’ Market. Regular Brunch highlights include: French Toast NC with persimmons, candied orange sabayon and maple syrup; Farm Egg Frittata with Benton’s bacon, cheddar, caramelized onion and local greens. ; or Smoked Trout Hash with local sweet potatoes, leeks, poached eggs, and fresh greens. Raw or baked Oysters are now in season and offered during Brunch service. A full bar is available as well as popular brunch cocktails such as mimosas with fresh-squeezed orange juice and Bloody Mary’s. Located in the former location of DeLuxe, PinPoint is a new jewel in the downtown fine dining scene. The name of the restaurant was derived from the name of a small community in Chatham County, Georgia. Chef Dean Neff is a protégé of James Beard Award-winning chef and cookbook author Hugh Acheson, who operates four restaurants in Georgia and regularly appears as a guest judge on Bravo’s Top Chef. PinPoint features the bounty of the Wilmington area’s greatest farmers, fisherman, and oystermen. We make every effort to present ingredients to our diners that are procured from the areas in which they live. While we think sourcing locally is extremely important, we also source high quality ingredients from elsewhere to provide variety to our guests. Our hope is to connect diners to the source of their food. To be a restaurant that truly uses fresh, local ingredients, the menu must accommodate available local ingredients, like fish, oysters and vegetables. Dean Neff combines these ingredients into a Daily Menu that includes recurring favorites, as well as inspired new offerings. PinPoint has an inviting neighborhood bar with premium liquors and craft beers on tap. Desserts are house-made and to die for… cheese cake, hot fudge brownie, key lime pie. Save room or come in for dessert and coffee. You found Santa’s Gift Bag. Now enter the contest to win all of the gifts in his bag. 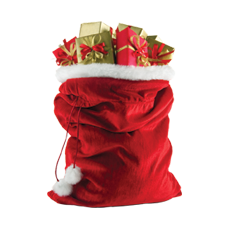 Click on Santa’s Bag to enter.